“When the moon hits your eye like a big pizza pie, that’s ananda“, sang Mary Pat Saturday morning at Namaste Yoga Studio. “There is no need for music, we will make our own music in our minds.”, she said with a hearty laugh and proceeded to explain that “ananda” is akin to bliss and there are many forms it can take. When I think of bliss I first think of happiness, but somehow the feeling of bliss goes beyond pure happiness. For me it conjures thoughts of an enlightened state of happiness, peace, and joy. That somehow when you achieve bliss, you’ve achieved everything. You are complete. You are whole. Some say that bliss is a state of “extreme happiness”. But I would prefer a less “extreme” adjective, perhaps bliss is more “supreme happiness” or, even better, “serene happiness”. The quote I chose to feature for this post, “Follow your bliss…”, I have always thought was just about career or purpose in life. But with that yoga class, I realize that it could be more than that. Can I follow bliss in a yoga class and become more open? Can I follow bliss by listening to music and feeling more emotions? Can I follow bliss by traveling, seeing other cultures and in turn valuing all humankind more? Absolutely! It applies to everything we do. There is a yoga studio in Cleveland called “Inner Bliss” – how great is that! 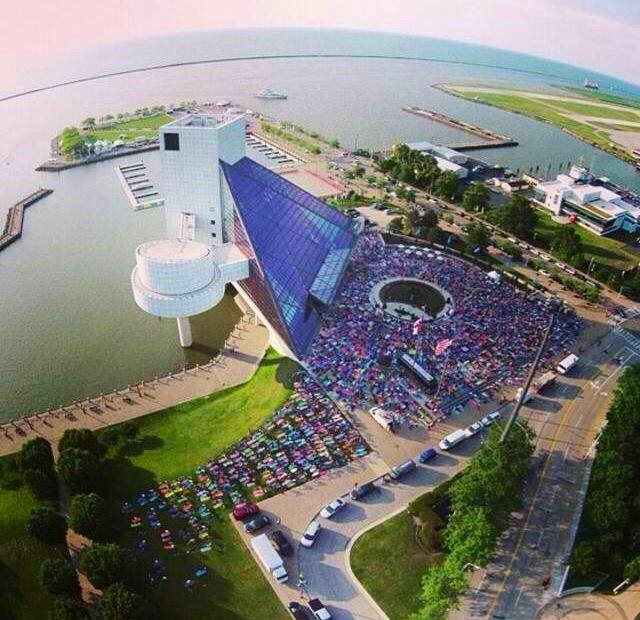 This weekend they sponsored a wonderful event at the Rock ‘n Roll Hall of Fame called “Believe in CLE”. It is essentially an outdoor yoga class and community gathering for hundreds of people and done so on a perfect summer night. I wasn’t able to attend but I was truly there in spirit, and the sense of community I witnessed through their photos and social media posts connected me to the bliss they achieved that night. I started this blog to explore my own joy of living (or “joie de vivre” as I love to hear and say in French) and those things that bring me to a state of happiness and bliss. I know that what is joy to me may not be joy to others, but I believe it is possible for everyone to achieve. I am so grateful for where I am and what I have that have allowed me to be open to these experiences. I hope that you, too, will keep following your bliss and achieve a serene, pure, supreme, and complete happiness that is yours alone.